The one pegged out as "practical" for Mothra vs. Godzilla is not something I ever took as his heat ray. I always thought it was a steam release or something, because the ground where Godzilla is was supposed to be a development or something so it would have had infrastructure and whatnot. Is there any context for this? I was a huge fan of Mighty Max play sets growing up, then when I went on holiday to America for the first time in 1995 and discovered there were basically Godzilla versions of the same type of thing, I about lost my damn mind! I bought all three I could find/knew were out at the time and loved playing with them, they were such awesome fun. Then I got super disappointed because I lost one of the buildings and never found it again. It wasn't until many years later that I discovered they also made "Godzilla vs Biollante in Washington" and "Godzilla vs Space Godzilla in Tokyo" sets too (as well as a couple of other larger-sized ones). I would have loved to have gotten those as well, but since they weren't advertised on the boxes of the ones I had (or in that advert) I'm guessing they didn't come out until a bit later. 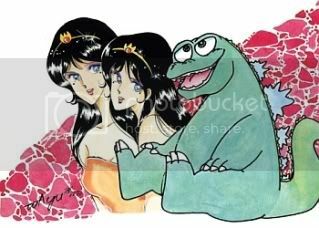 I'd love for a top-down history of the Trendmasters Godzilla toyline. It was so important to my childhood, but it still seems crazy to me that it existed in the first place! A Toho Kingdom user has uploaded high quality scans of his Godzilla vs. Megalon and G2K 35mm trailers to Archive.org. And here's the link to his original post. Zilla vs. Gorosaurus animated battle! This one's real special. Be sure to watch the whole thing! The gore was a bit unnecessary and the animation was a bit cartoonish, but overall well done. Amazing fight, I guess that's the original Zilla instead of his son. Also funny how cat-like he behaves. I really dig Zilla's characterization in this animation. Making him the underdog was smart. X Y C - a single grey icon of Hedorah. No music. X Y P - a red icon of Gigan that turns into Ghidorah. You might only see the switch if you scroll far enough to the right. The text when you try to select something is also red. No music. X Y S - a few level icons with the GH1D0RA level music. X Y T - red and grey level icons and a hissing noise. X Y 9 - all black, no music. Another GEMSTONE Video. This time it has real monster action. It's a very short animation, but very cool. The Gemstone videos are super cool! I'm not quite sure what the parameters of the contest are. I read Higuchi's the judge? I wanna make time to watch a bunch of them together.